Who is responsible? 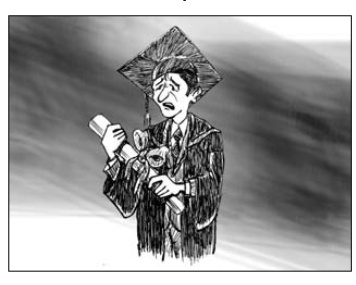 A generation of educated youths is waiting to enter into teaching positions in the higher education but the places for such positions are hardly vacant.The universities should make a plan to bid farewell to those who are not fit in the system. Otherwise our higher education will be crippled for another 20 years. The debate on higher education for all is still on especially in a country like ours. On one side the production of higher education graduates is increasing each year and on the other the unemployed rate of graduates is also increasing. Only 16 per cent of the higher education graduates are fully employed, some are semiemployed, some under-employed and many of them are unemployed. People talk about entrepreneurship but not all can invest to become self-employed. That is the reason why one can see these frustrated youths spending their time in coffee shops, streets, parks and everywhere being a burden to their family and the nation. They try their best to get a job wherever possible, but the response they get is always negative. To the most nepotism has led many of these youths, who have no near and dear ones in power positions, to frustration, depression and tiresome positions. Our educational system cannot confirm that the graduates are capable to perform the job required by the market. One can see the job advertisement for different positions in the newspapers requiring communica tion skills, English language proficiency and computer skills at advanced levels. Majority of our university education system has not been able to produce such human resources. This is another reason why many graduates remain unemployed. The other aspect is even dangerous i.e., the capability of working teachers in higher education. Many of them are above 40 years of age who have their 16 years of schooling after SLC, not enough background to teach 12+4+2 system at par with the international standard. That is why most of the TU Bachelors' programs are still confined in 3 years. Teachers themselves do not have the kind of proficient language and computer skills so the pedagogy is nothing more than chalk and talk. Then how can we envisage employment of our youths taught by them. A university, where 95 percent students are studying and thousands of professors are working, has not been able to capacitate its teaching force rather the mass of teachers seek promotion without competition--self promotion or promotion without competition. Let us discuss another crucial issue that always leads to chaos and confusion in higher education--the appointment of Vice-chancellors, Rectors and Registrars. When responsible political parties divide the share of the positions, not according to the capability of the persons to be appointed but the color of the political flags, then higher education lands nowhere. This share of position trickles down to selecting campus chiefs and others in the campus level too. These highly politically motivated figures have not been able to exert educational leadership in academic institutions. Another reason for degraded higher education is the activities of student unions. These polit ically colored so-called student unions are mobilized by the remote control of their mother political parties without having any programs for students' welfare on their own. Instead they have been involved in such activities which always hamper studies of hundreds of thousands of students each year. Thus parents, who can afford their wards' education, send their children abroad. These children, seeing the country's poor situation, sell themselves even in a smaller price outside. This has led brain-drain in a massive way. Each year the MoE gives permission to thousands of students to study abroad without knowing why? Should the MoE be concerned about the use of their knowledge and skills to the motherland? Have they yet been able to devise policies to motivate these youths after their graduation to serve their country? Have they made any attempt with the government to create genuine work environment for those who return with advanced skills from abroad? If not how can we expect that our children educated outside would come back to us? In this situation it is a must that we improve our higher education linking it with the de velopment plan of the country. The apex planning body of the country, the National Planning Commission, does not have a plan of human resources required for the country in different disciplines. Thus, it is required that the NPC be active in preparing human resource plan for the next 20 years to lead universities to produce graduates in that direction. Similarly a generation of educated youths is waiting to enter into teaching positions in the higher education but the places for such positions are hardly vacant. The universities should make a plan to bid farewell to those who are not fit in the system. Otherwise our higher education will be made crippled for another 20 years until the present group is retired contributing nothing. For example, the recently phased-out Proficiency Certificate Level at TU has made many teachers jobless. Many of them do not even dare to teach in Bachelor's classes let alone the Masters' one. Reform in higher education from the perspective of its relevancy is highly required. Fighting for equity is one aspect but forgetting the essence of its relevance can't be tolerated.